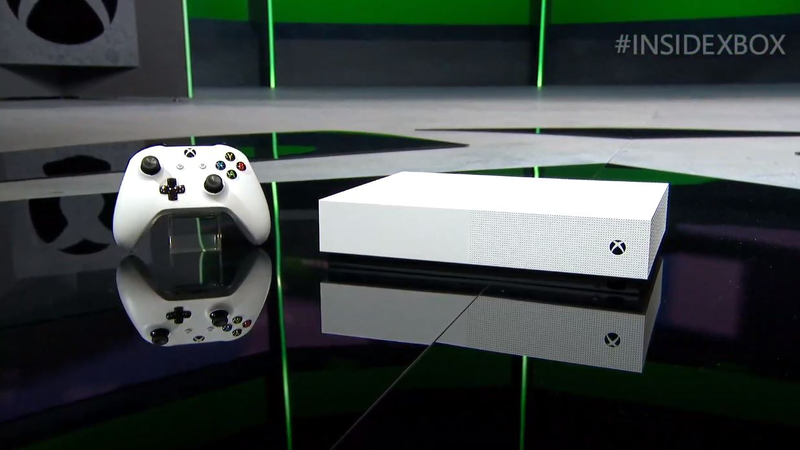 Microsoft officially announced a new, all-digital version of the Xbox One S during the latest episode of Inside Xbox today, confirming previous rumors. It will have a 1 TB hard drive and be priced at $250, with Microsoft saying it will receive price drops as necessary that will make it always cheaper than the standard Xbox One S.
“We expect to maintain at least a $50 difference between Xbox One S and the all-digital version during sales,” said Microsoft’s Lawrence Hryb. That means that while the price of the Xbox One S All-Digital is technically $250, it will sometimes be less than that. For example, Microsoft currently lists several Xbox One S bundles, including one with The Division 2, for $250. Based on what Hryb said, the Xbox One S All-Digital should only be $200 right now. Currently, however, pre-orders for the new console are priced at $250. Microsoft did not immediately respond to a request for comment on the apparent discrepancy. The Xbox One S All-Digital Edition is the same as the existing Xbox One S minus the optical drive, meaning it won’t play physical discs. Instead, players will need to download games from the Microsoft Store. To help with this t comes with Minecraft, Sea of Thieves, and Forza Horizon 3 pre-installed. In addition, owners will have the option paying $1 for a three-month subscription to Xbox Game Pass. Microsoft also announced Xbox Game Pass Ultimate today, a subscription that combines both Game Pass and Xbox Gold into a single bundle for $15 a month. It’s clear the All-Digital Edition and new Game Pass Ultimate tier are meant to dovetail together, but since neither is dramatically cheaper than the existing alternatives, the entire package feels slightly lackluster. In exchange for a $50 discount upfront, potential All-Digital owners are giving up the optical-drive, and with it the ability to take advantage of cheap, older used games from not just this console generation but past ones as well thanks to Microsoft’s robust backwards compatibility program. For people who only plan to download games digitally it’s still a nice, cheaper option to have, but it’s not as aggressive as some might have expected this late into a console generation in which the Xbox One has lagged behind its predecessor.